Tapered in width and thickness, coming to a point. 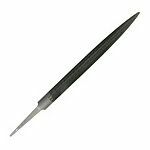 Narrower than regular half round, and therefore, useful for filing inside of rings.j Cut Length 6" (150mm);Width 15/32". (11.9MM); thickness 9/64" (3.6mm).